As April rain fell on Wall Street, employees at Bank of America stood between potted plants in their second floor offices and looked down at the angry crowd below. The people in the crowd waved plastic-draped signs, chanting “shame” and “bankers come out.” The bankers smiled, took pictures on their cell phones, but did not come out. The crowd moved on to yell at others. Americans are clearly mad – at greedy bankers, Wall Street bank bailouts and others – but their protests haven’t reached a critical mass and unity of message that would effect meaningful political change, experts say. Instead, they’re really just venting. 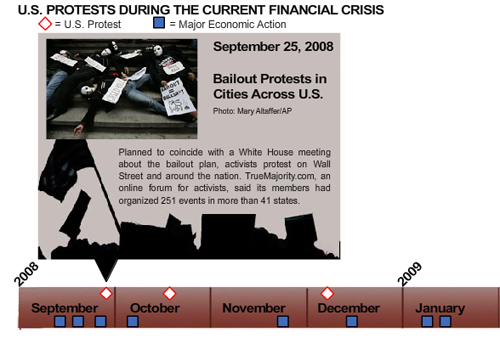 Most U.S. protests of bank bailouts, for example, have been limited to several hundred people per event – as in the case of a September 25, 2008 Wall Street demonstration and March 19, 2009 rally in the Financial District of San Francisco. Maybe the rain was a drawback on April 3, when fewer people than expected (hundreds, not thousands) protested the Federal bailouts of Wall Street banks and the $165 million of American Insurance Group bonuses. Experts including historian Howard Zinn called the rally, along with similar ones throughout the country, a mild response. The rally also lacked a clear focus of the anger. Protesters chanted about bailouts but also complained about mistreatment of Guantanamo prisoners anr Israel’s occupation of Palestine. The mixed messages may have diluted the rage. This unfocused approach has little meaningful effect on policy and doesn’t really spark the anger some Congressmen have displayed in recent weeks, according to Robert Reich, former U.S. labor secretary and professor of public policy at University of California Berkeley. Reich wrote on his blog (http://robertreich.blogspot.com) that Congressmen responded to a wave of mail and phone calls rather than people taking to the streets. In Europe, the numbers of people protesting the recession have been substantially higher. In February, over 100,000 people brought central Dublin to a standstill. Around 35,000 showed up to the G20 protest in London (though many were anti-capitalists before the recession). And in France, millions took to the streets in January and March. U.S. citizens are much more likely than Europeans to go directly to their elected officials rather than express their rage in the form of a protest, wrote Reich on his blog. Out of work! Now what? New Yorkers who are recent casualties of the economic crisis are finding unique ways to hunt for work and fill their spare time. For some, the answer is as easy as daytime television. Others stay active in the job hunt by networking. Then there are those, as Rachel Geizhals reports, who choose to work on their most important tool, their bodies. Gym memberships are on the rise, and at least one New Yorker is hitting the mat. Eric Rubin was never a couch potato. Before he lost his job as an environmental engineer, Rubin went to his local New York Sports Club for about three hours a week. But since he was laid off in October, Rubin, 26, has been working out almost triple that amount. “Even though nobody likes being unemployed and being broke, I have all the time in the world to go to the gym,” said Rubin. Rubin is not the only one spending more time at the gym. Other New York Sports Clubs have noticed an increase in use of their facilities. Eric Duquette, assistant general manager at the West 41st Street branch, said not only are members staying at the gym longer, but there has also been an increase in membership sales. Since more people are out of work, television watching habits have changed. For some, more free time means more quality time with the likes of Oprah, Ellen, and the other kings and queens of Television. Our own Kristen Joy Watts spoke to job seekers at the Labor Employment Services Office in Fort Green, about their watching habits. Jamar Minto, 28, is a plumber’s assistant, but he’s been unemployed for the last six months. He said that he watches TV “all the time,” on his 58″ television set. He used to spend between four and six hours in front of the small screen. Florence Morgan has been unemployed for the last six months. She used to work as a substance abuse counselor at a non-profit organization. Morgan, who used to watch about four hours of television a day, now keeps her television on more than ever. Diane Carter has been unemployed for the last three to four months. She used to work in security. Before, she said, she didn’t have a lot of time to watch TV in between shifts. Now she watches even less. According to a survey by the International Health, Racquet and Sportsclub Association, membership at 180 sports clubs either stayed the same or increased in January of this year. Why are some people exercising more? The downtime that comes with joblessness may provide people with the opportunity to explore a passion, said Lindsey Pollak, a career development guide writer whose focus is young professionals in the job market. If the alternative is watching soap operas all day, working out is a positive thing, said Pollak. But Pollak warned that exercise might be used as an excuse to escape reality and hide from a job search. “Moderation is everything,” said Pollak. One of the best ways to get back into the job market is to network. Rima Abdelkader spoke to professionals on the hunt at a networking event at Leisure Time Bowl at the Port Authority’s South Wing in Midtown. Boxing fans gathered Wednesday night in Brooklyn to watch 14 young hopefuls battle it out to advance in the famous Golden Gloves competition. Held at Thomas Jefferson High School, the event was just one in a 10-week series of bouts before the final showdown at Madison Square Garden on April 16th and 17th. The Golden Gloves, which began in 1926 and was founded by New York Daily News sports editor Paul Gallico, is the premiere amateur boxing event in the country. While the competitions occur nationwide, the New York title is considered by many boxing fans to be the most elite. “They say Madison Square Garden is the Mecca of boxing, then the Golden Gloves are the Mecca of boxing competitions,” said Eddie Acevedo, president of the USA Boxing Metropolitan Association, who hosts the events. The Daily News sponsors the program. The competitors, donning gold and blue silk robes, waltzed around the gym, throwing punches and warming up while their family and friends waited anxiously on the sidelines. On a set of blue gym bleachers sat Hussain Abdullah of Coney Island, who came to watch his 25-year-old son, Faisal Abdullah, compete in the final match of the night. One of the first winners of the night was Wesley Ferrer, a slim 16-year-old from Brooklyn who says he trains six days a week at the Brotherhood Boxing Club in Ridgewood, Queens. Ferrer defeated opponent Louis Cruz in the 132-pound novice bout, the second match of the night. He came at his opponent with a ferocity that wouldn’t expect from his young frame. Last week, at a Golden Gloves match in Brentwood, Long Island, a 24-year-old competitor ended up in the hospital after suffering a traumatic head injury during a fight. Angelo Piccirillo of Astoria, Queens, was rushed to Southside hospital, where doctors predict he has a 70 to 80 percent chance of making a full recovery. Ferrar said the chance of an injury is always there, but that he tries not to think about it once he steps into the ring. Ferrer’s 25-year-old cousin, Luis Almanzar of Williamsburg, was ringside to cheer his little cousin on. He loves everything about boxing, he said, and has been coming to Golden Glove matches for years—his older brother is a two-time champion. The benefits of the sport outweigh the grueling training and the risk of injuries, he said. It certainly gets you exposure. Some of the biggest names in boxing—including Floyd Patterson, Jose Torres and Sugar Ray Robinson—were once Golden Gloves champs. Acevedo, who now runs the show, said he also took part in the competition back in the 1970s. Almanzar said that for he and his cousin, boxing is more than just a hobby. 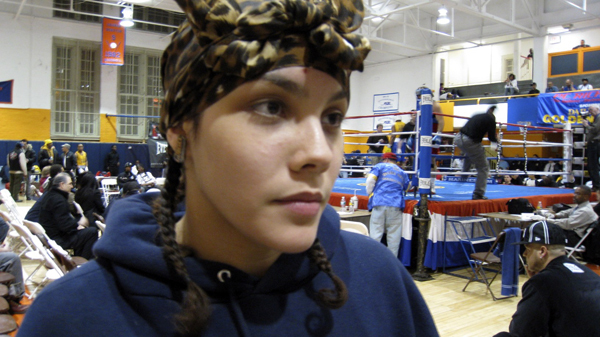 Women Boxers will also participate in the Golden Gloves Semi-Finals. Nearly 100 Tamil Americans gathered outside of the Sri Lanka Mission to the United Nations in Midtown Manhattan on March 16, chanting for a cease-fire in the war torn northern region of Sri Lanka. In recent weeks, the Sri Lankan military has made significant advances on the Liberation Tiger of Thamil Eelam (LTTE), an ethnic separatist group that has been at war with Sri Lanka since 1983. The international Tamil community responded to the military advances and what they call genocide against Tamilis by holding rallies in New York City, Washington D.C., and Toronto. Tamil Americans Against Genocide organized the New York rally. The New York rally drew Tamil-Americans from the tri-state area who took off from work and school to urge the United Nations to call an end to the fighting. The peaceful, at times listless protesters stayed in an orderly pack behind police barricades and recited slogans. Listen to the protest chant. Protestors waved hand made signs and printed pictures of mutilated bodies that, they say, the Sri Lankan government is responsible for. Some signs reading “Freedom Fighters,” responded to the common accusation that Tamil Tigers, who have a history of using suicide bombing and civilian attacks, are a terrorist organization. Bala Tha, 60, a transit worker who lives in the Bronx has lived in the United States for 30 years. He explained the goals of the protestors and addressed the use of violence by Tamil forces. The mostly older crowd sang traditional Tamil songs. Thiladm Rama, 60, of Hillside, Queens, led the singing. Jamune Kiru, 40, of Floral Park, Long Island, has been in the United States for 15 years, but worries for her brothers and sisters that are still in Sri Lanka. A protest organizer discusses whether the Tamil Tigers are terrorists. Posted on 19 March 2009. The 248th annual (yes, you read right, two-hundred and forty-eighth) St. Patrick’s Day Parade in New York City gives the world permission to be Irish for a day. The Parade’s first march up Fifth Avenue was in 1762, and this year in 2009, the day is still as special. People came all the way from Ireland herself, Argentina, China, and many other countries to honor the patron saint of Ireland. Partying begins in the morning. Toasts are made with green beer. Four leaf clover and smiling leprechaun stickers are pasted to most store windows, and there are few who don’t wear at least one article of green clothing. The festivities kicked off at 44th Street and Fifth Avenue, and bagpipers, bands, and politicians made their way up to 86th St. The St. Patrick’s Day Parade is known as one of the most famous and highly attended parades in New York City, and this year’s parade proved it. Posted on 16 March 2009. There have been news about Marty Marcowitz wanting to build an amphitheater in Asser-Levy Park. I put together a slideshow about it. One of the last 1 trains passes through the old South Ferry station. This station first opened in 1905. 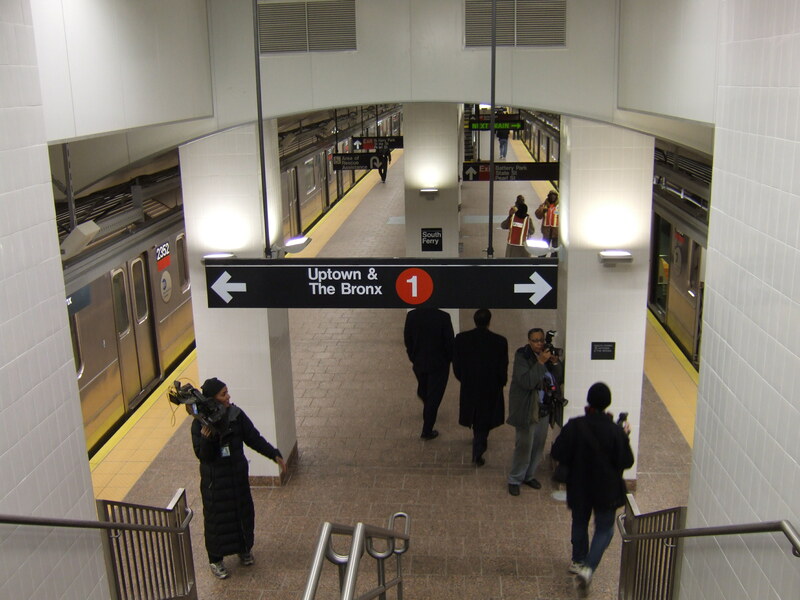 The South Ferry loop on the 1 train opened in 1905, allowing a one-seat ride between the Staten Island ferry and Harlem. 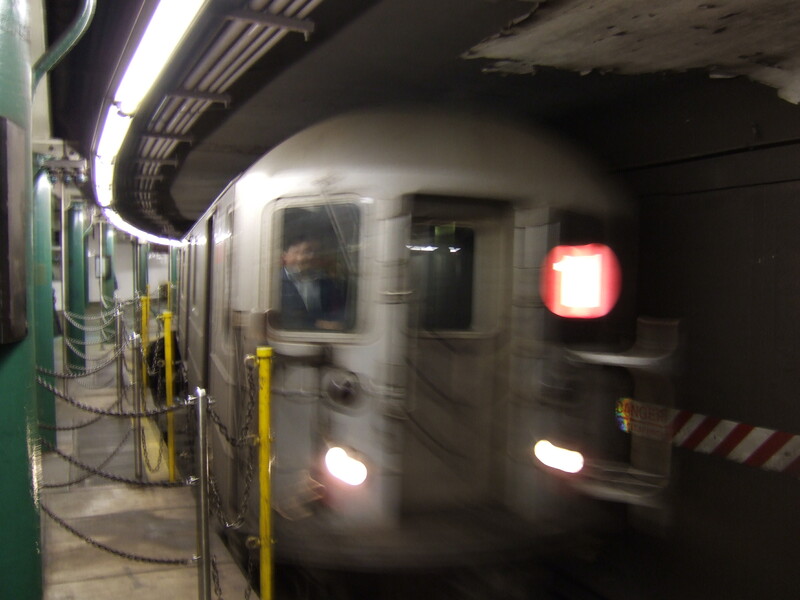 By 1946, subway trains were expanded to 8 cars, and the station became obsolete. Without room for growth, its tight loop forced passengers to move to the first four cars, in order to access the station. Gap fillers moved the platforms closer to the train doors. Platform gap fillers from Sergey Kadinsky on Vimeo. Curvy and crowded, the old station was a source of frustration for commuters rushing for the ferry. 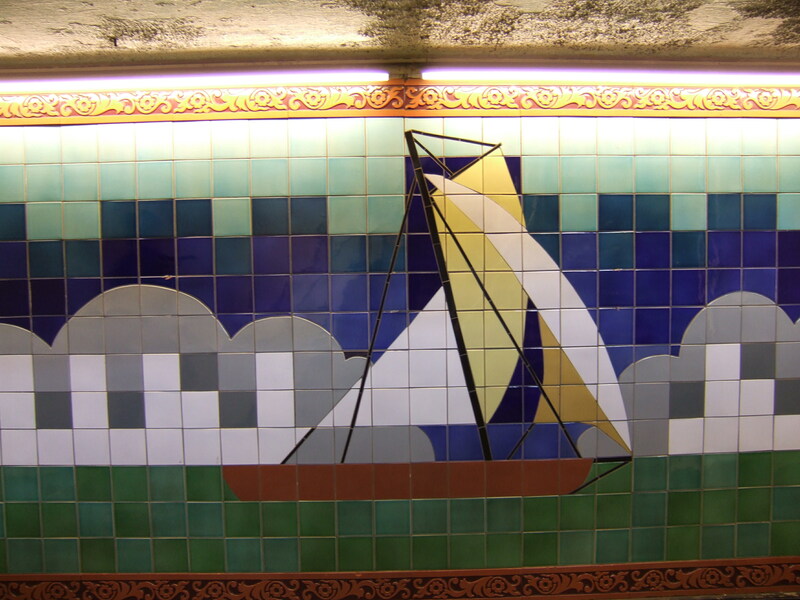 Each station on the early 20th century IRT lines had its own theme artworks. 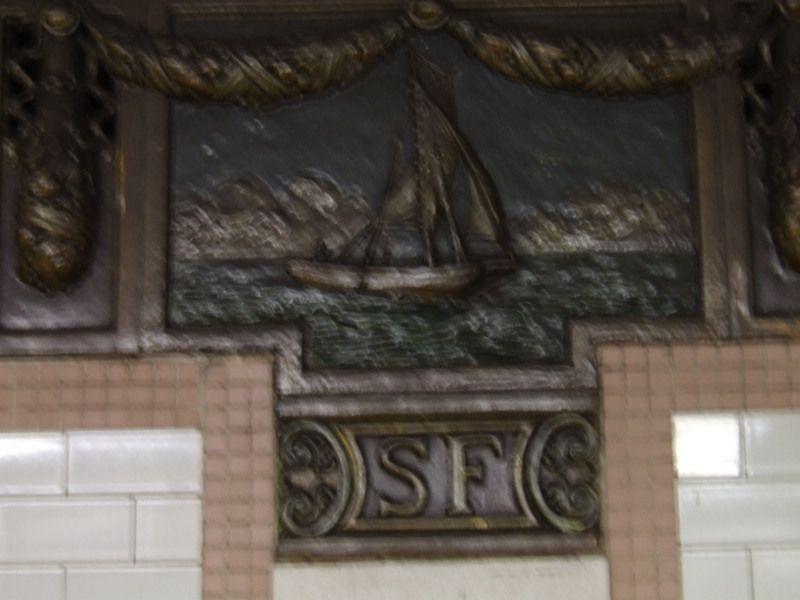 For example, the Wall Street station had reliefs of the namesake wooden wall from the New Amsterdam period. 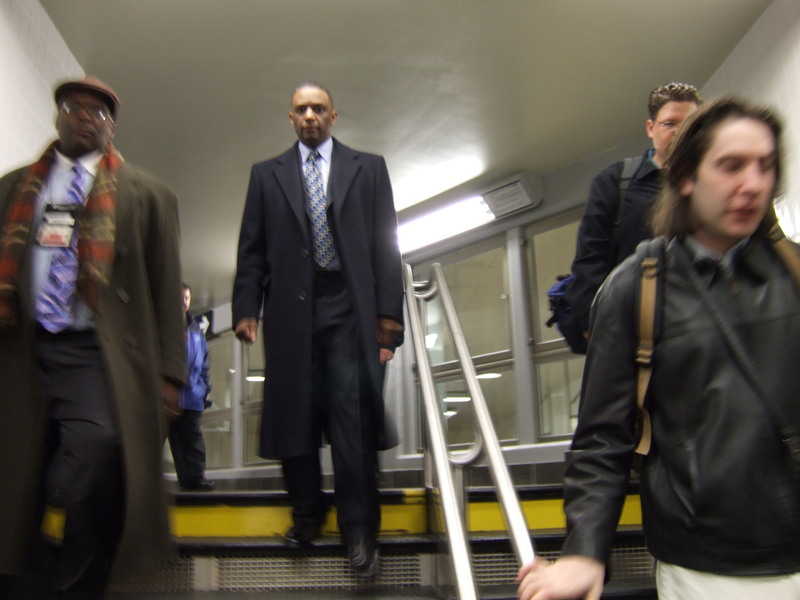 In 1990, the Arts for Transit Program commissioned a modern adaptation of the theme. Its artist, Sandra Bloodworth, is the current director of the program. Sail artwork by Sandra Bloodworth from Sergey Kadinsky on Vimeo. As of today, both of the above artworks are no longer accessible to the public. 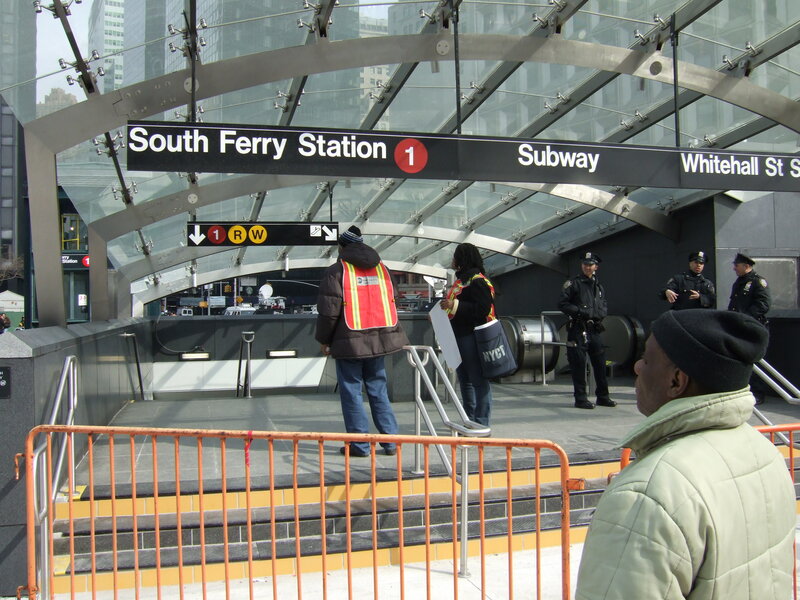 In their place, the new South Ferry station boats of more ambitious designs. 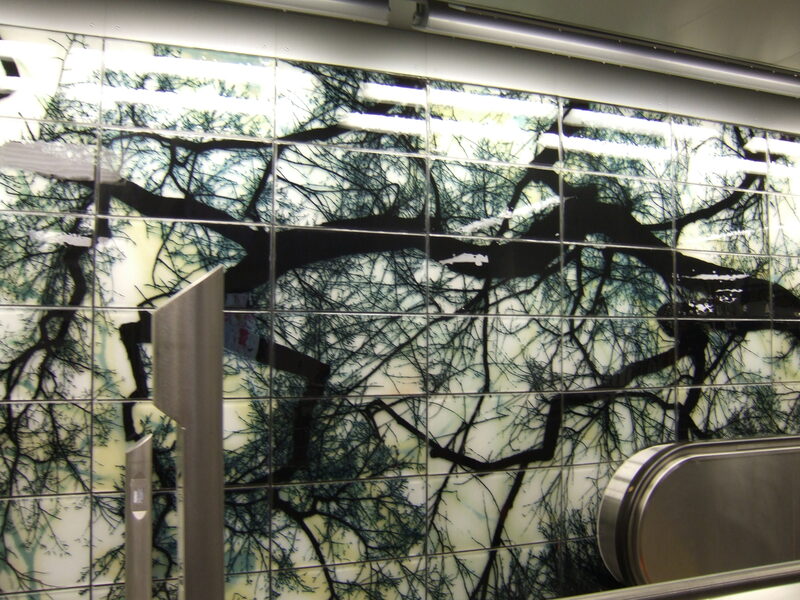 Artists Doug and Mike Starn of Red Hook, Brooklyn, designed the installation for the new South Ferry station, entitled “See it split, see it change.” The Starn brother say the nature motif represents interconnection between the train’s riders: riders begin at the South Ferry and “branch out” all over the city. 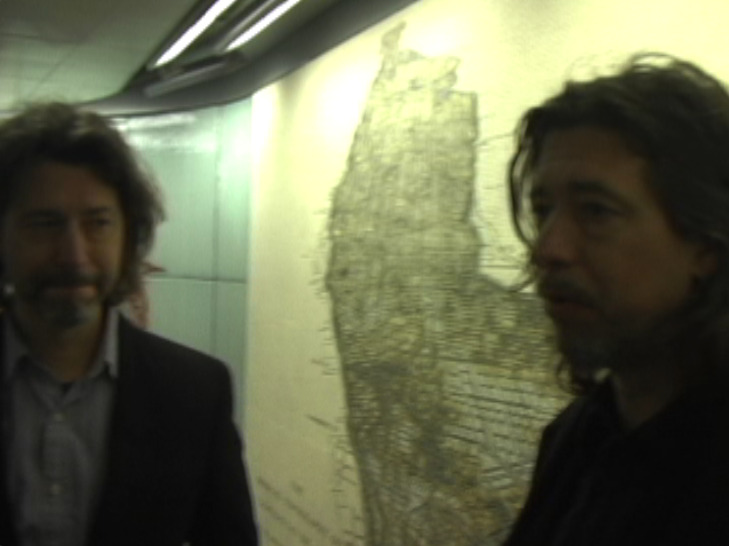 One of the highlights is a mosaic map of Manhattan, pointing upward on the wall. The map shows Manhattan’s landscape in 1640 and today. 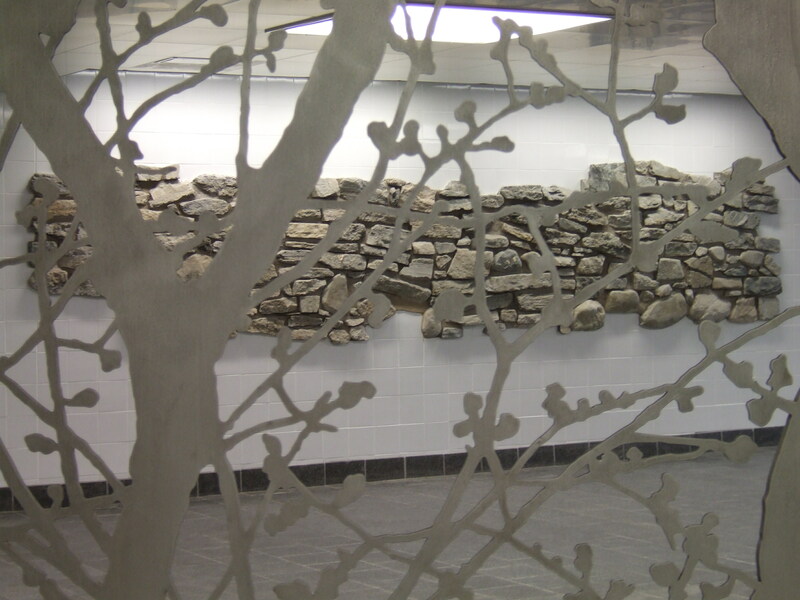 Pictures of branches on the wall look over the escalators at the new station. Many of the branch pictures were taken in nearby Battery Park. 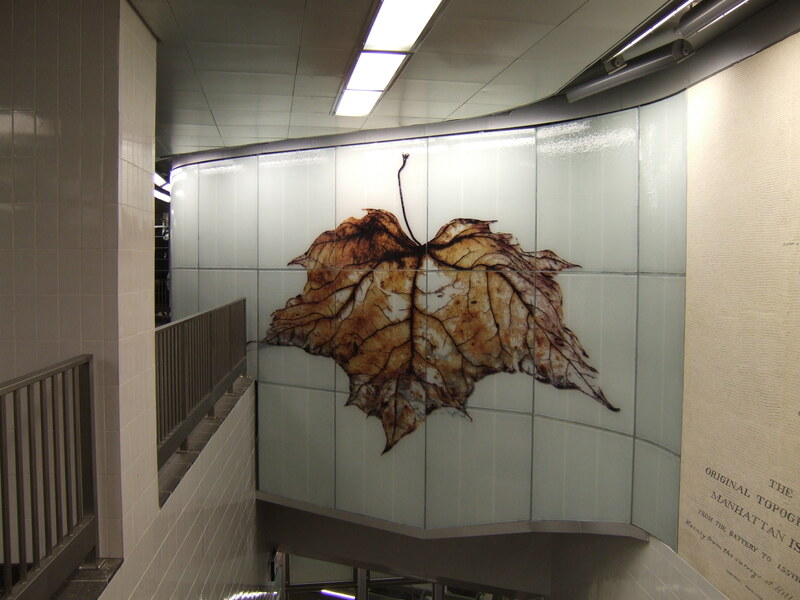 A maple leaf watches over the stairs leading to the new station. 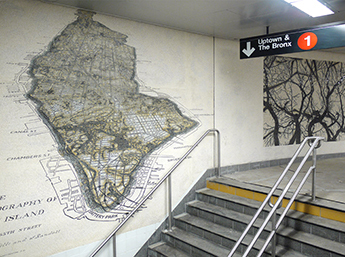 Through a silver leaf gate, the station displays an original piece of wall from New Amsterdam. The wall was discovered during excavation for the new station. 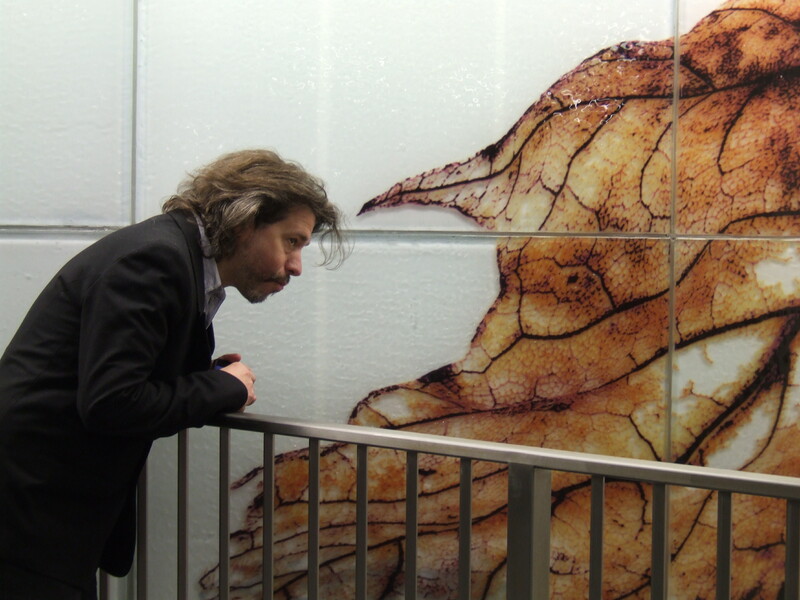 Artist Mike Starn looks over at his work as the first passengers enter the station. The new station didn’t open until noon, but people started showing up early. 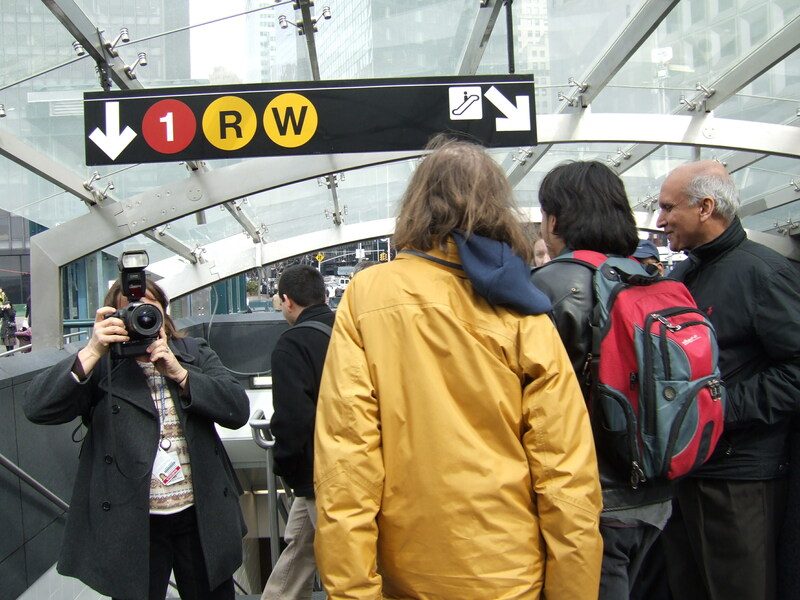 Once the Transit Authority gave the word, passengers began running in, attempting to be the first passengers to ride from the new station. 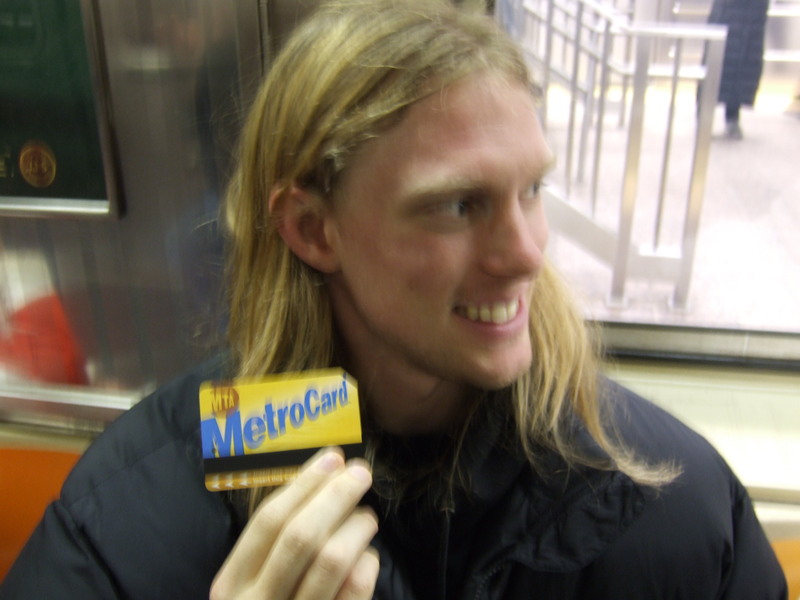 Scott Sandefur, a tourist from Washington, D.C., holds up the first MetroCard bought at the new station. David Spectra from Sergey Kadinsky on Vimeo. 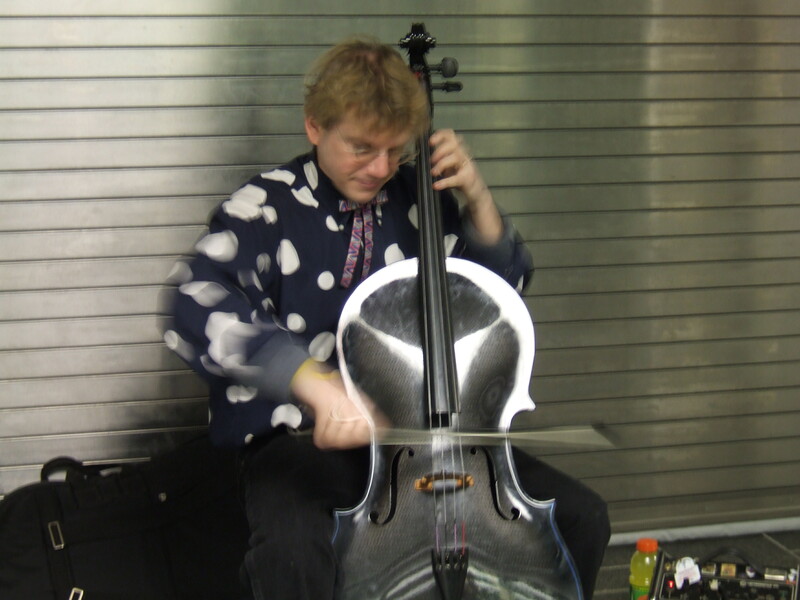 Subway musician Sean Grissom from Sergey Kadinsky on Vimeo. By Lois DeSocio, Jacqueline Linge, Maureen Sullivan, and Brian Winkowski. The New York City real estate market is no longer immune to the real estate drop that is hitting the rest of the country. Home values and sales have decreased throughout the metropolitan area, according to the Real Estate Board of New York. As a result, there is increasing anxiety among buyers and sellers, who are forced to navigate through news about plunging financial markets and shady mortgage lenders. Jenny Laden is one of those sellers who is feeling the collective anxiety. She’s a single mom and an artist in Brooklyn who has lived in a Park Slope co-op in for ten years. “All bets are off in this market and that’s very destabilizing and nerve-wrecking,” says Laden, whose home has been on the market for months. She has lowered the price twice already, and expects to have to lower it even more. Home sales in Park Slope have decreased by 2.9 percent in the last year, with the average price per square foot for a co-op decreasing by 5.1 percent. And as noted above, it’s not just Park Slope that’s being hit with lower sales and home values – all of New York is feeling the effects of a declining real estate market, including Manhattan, Brooklyn, Bronx, Queens, and Staten Island. Okay – so while the reasons for fear and anxiety among sellers is real and palpable, what about the buyers? How could they possibly have anxiety when the market is in their favor? “The anxiety with the buyer right now is very different than it used to be,” says Michael Palka, the president and COO of White Cat Media, an online media company which owns SheFinds.com and MomFinds.com. Palka owns an apartment in Manhattan and is currently looking for a bigger place. “It used to be I’m going to get priced out and shut out of the market place and I’m going to have to move somewhere that I don’t want to move to,” continued Palka. He states that now the anxiety stems from buying an apartment prematurely, before the market bottoms out. “I’ve seen several things already that, you know, if I would seen these a year ago, I would of jumped on them. Now it feels just the opposite. We shouldn’t go for it, because we can do even better in another six months,” says Palka. Real estate agents are well aware of buyers freezing with indecision. There’s even a new catchphrase among some realtors—analysis paralysis. Clients get lost in the numbers and can’t make a decision. This “anxiety overload,” according to a recent study published in Realtor Magazine Online, by the National Board of Realtors, has given realtors much to fret about. They have fewer clients, so their incomes are shrinking. Many clients hesitate to drop their prices, so homes don’t sell and buyers aren’t buying in the hopes that prices will drop even more. Christopher Ressa is a sales associate for the Corcoran Group in Manhattan. He says while it took a little longer for the recession to impact real estate in New York City, the effects are now being felt. Housing prices have fallen by 20 percent and will most likely keep falling. And despite the lowering numbers, buyers are still holding out for those bottom numbers. However, Ressa sees a silver lining behind the dark real estate clouds. He believes the declining trend will not last for long, as interest rates for home mortgages are at an all time low. Those are the grades that HIV and AIDS advocates gave to New York City’s health care services. To mark President Obama’s 50th day in office on Wednesday, March 11, AIDS and HIV prevention advocates from around the country issued a health care report card grading the nation’s progress in finding a cure for the epidemic. The “End AIDS Report Card,” compiled by the activist organization Campaign To End AIDS, failed the city across the board on the services such as housing and medication distribution. According to a Housing Works representative, the “End AIDS Report Card” was based upon information provided by various AIDS advocacy groups that lobby for AIDS-related funding and services at city, state and federal level. Activists and supporters, like local entities Housing Works and Harlem United Community AIDS Center, gathered at various locations across the country, such as New York and Washington D.C.. Protesters staged a rousing, speech-filled rally. They displayed large, color billboard report cards detailing their negative assessment of the city’s health care missteps. And they distributed educational pamphlets, orange stickers and free contraceptives – – all in an effort to bring awareness to the issue. Slideshow - HIV/AIDS activists rally in front of a statue of Adam Clayton Powell, Jr. in Harlem. Click on photo above to start the slideshow. Without commenting on the city’s future funding for HIV-related services, a spokesperson for the city’s health department cited their recent AIDS prevention efforts through condom distribution, syringe exchanges and voluntary testing. The City Council is currently holding hearings on the proposed budget for fiscal year 2010, which at this time includes cuts of nearly $2 million in case management staff for HIV/AIDS, among other related reductions. Click here to see the United States’ AIDS report card. Click here to see New York State’s AIDS report card. Click here to see New York City’s AIDS report card. 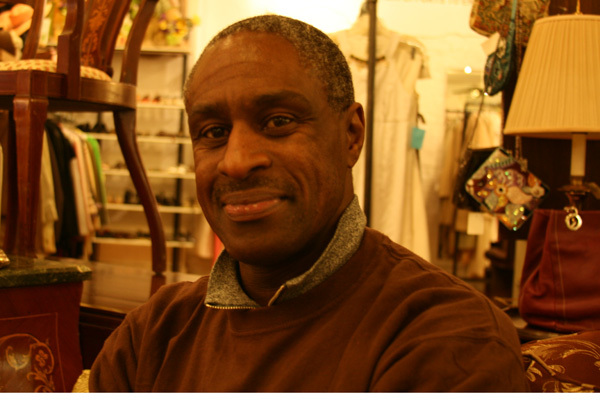 Frederick Taylor, 51, who works at a Housing Works thrift store, fears that cuts to funding may endanger services like public housing and non-pharmaceutical treatment offered to HIV-infected people. Click the arrow to play. 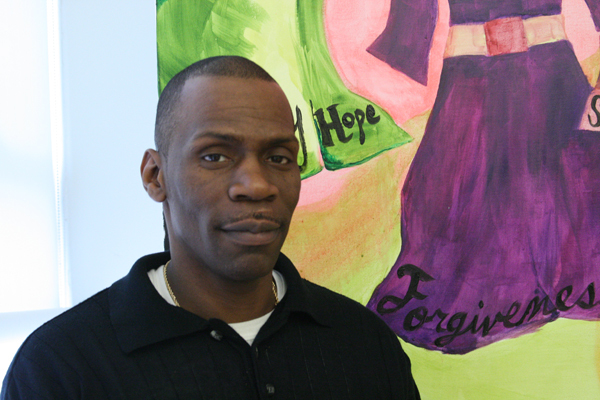 Rodney Robinson, 45, a senior peer educator at AIDS Service Center, explained why he thinks it’s especially problematic for New York City to cut HIV/AIDS services. Teenagers these days aren’t just thinking about love and movies; they’re worried about how they’ll pay for college in a recession. For these seniors, saving money is the goal. Ivan Collado, a senior at Archbishop Molloy High School in Queens, was accepted at the University of Michigan, but the $30,000 financial aid package he was offered isn’t enough to cover the $44,797 tuition. His dad’s income is already stretched too thin supporting a family of five, so Ivan knows he’ll have to turn the school down. “It felt worse than a rejection,” he said. While tuition is up at both the City University of New York and the State University of New York, private scholarships are down, said Kerry Hughes, a college adviser at Molloy. Even at the private school where she works, students are making tough choices this year about where to apply to college. Ivan’s classmate Sydney Umana dreamed of going to Penn State. But all that changed when she got a full scholarship to Felician College in New Jersey. Though senior year is a notoriously expensive time for adolescents, parents of this year’s graduating class face more than the typical financial pressures as they prepare to send their children out of the nest. For many families, tough times mean smaller college funds than they expected. But before college tuition hits, these teens have another major expense to contend with first—senior prom. The event can cost hundreds of dollars once dresses, tuxes, transportation, flowers and entrance fees are all paid for. Megan Kerrigan, co-founder of the non-profit organization Operation Fairy Dust that provides girls with donated prom dresses and accessories, said she’s been getting more calls than usual this year. She estimates she has enough dresses to outfit 6,000 girls, but with the meager cash donations Fairy Dust receives annually– “$1000, if we’re lucky”– she can’t afford to rent a space big enough to give them all away. This year, with corporate donations smaller than usual, she expects to help 1,000 girls. In the face of overwhelming prom expenses, many teens are bargain hunting for their outfits, shopping in groups to get discounts and checking cheaper venues. But with more serious expenses ahead, Ivan Collado can still laugh about the money he doesn’t have to pay for prom. “Can we take out loans for prom and pay it back later?” he joked. Megan Kerrigan of Operation Fairy Dust says the bad economy has left her organization with more girls in need, but fewer cash donations to make it happen. © 2019 NYC On Deadline. Powered by WordPress.